Summary: In New York Times bestselling author Tracy Chevalier’s newest historical saga, she introduces Honor Bright, a modest English Quaker who moves to Ohio in 1850, only to find herself alienated and alone in a strange land. Sick from the moment she leaves England, and fleeing personal disappointment, she is forced by family tragedy to rely on strangers in a harsh, unfamiliar landscape. I've been on a bit of a historical fiction kick lately, so THE LAST RUNAWAY by Tracy Chevalier really appealed to me. I also thought it was a good book to read and review during the month of February since it's Black History Month and this novel explores some aspects of the Underground Railroad. 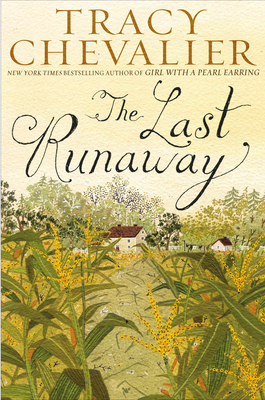 THE LAST RUNAWAY tells the story of a Quaker girl named Honor who leaves her home and family in England to move to Ohio in 1850. Honor is basically running away from a personal embarrassment and heading to the United States to live with her sister and her future husband. When Honor's sister unexpectedly dies during their travels, Honor finds herself all alone and isn't quite sure what to do. She turns to a variety of strangers to help her including a woman who owns a hat shop, her sister's fiance, and others in the Quaker community. It's definitely not an easy journey for Honor. She is desperately homesick and is mourning the loss of her sister; however, she turns to her faith and the Quaker community to help get by. On day, Honor discovers that there are certain members of her local town who assist runaway slaves, and she finds herself wanting to be part of the Underground Railroad. Unfortunately, Honor learns that her new family doesn't share her personal beliefs that all humans are meant to be equal, and Honor must decide if helping these individuals is worth losing everything else in her life. Overall, I enjoyed THE LAST RUNAWAY, but I'm not sure it was entirely what I expected. I knew from reading a few other reviews of this book that it wasn't focused on the Underground Railroad. Rather, it was more of Honor's story about adjusting to her new life in the States and the Quaker community that she lived in. However, I guess I still expected there to be more about Honor's role in the Underground Railroad. That's not to say that I was disappointed with this novel because I definitely wasn't. I enjoyed THE LAST RUNAWAY a great deal and I was extremely impressed with how Ms. Chevalier blended fact with fiction in her story. It was apparent to me that the author did a tremendous amount of research not only on escaped slaves and the Underground Railroad, but also on Quakers and their role in this process. I found many aspects of this novel to be extremely interesting. I really liked Honor and thought she was a realistic and well developed character. At the beginning of the novel, my heart broke for her (over and over again) as she lost her sister and was on her own in a strange land. However, I soon began to notice her strength and compassion. That's not to say that I didn't find her a bit odd at times and I certainly didn't always agree with her actions, but I respected her religious beliefs and her desire to help others. In addition, I found it intriguing to see how much Honor's character evolved throughout the novel. I think much of her change had to do with two of her friends who were integral parts of the Underground Railroad. While these women were very different from Honor, they both showed Honor valuable life lessons about strength and courage. They also taught her about the power of standing up for what one believes in. Furthermore, I loved how this novel explored these unlikely friendships and the sacrifices these women made for others. Even though at its heart, THE LAST RUNAWAY is Honor's story, there is still enough drama to make it a page-turner. As the suspense builds towards the end of the novel, I found myself caught up in Honor and her actions; and I was very interested in seeing how things would turn out for her. THE LAST RUNAWAY would make an interesting book club pick. I wasn't able to find a reader's guide, but I doubt one is necessary to generate discussion. There are many underlying themes which warrant more analysis including marriage, responsibility, faith, parent/child relationships, sacrifice, defiance, friendship, and love. I also think many of the characters are quite interesting as well. Definitely recommended to fans of historical fiction and stories about strong women! I do like strong women but not so much historical fiction. I have this one on audio, though, so I'll probably give it a try. I always appreciate hearing about good discussion books!